Gebel el-Asr does not appear to be a typical Egyptian archaeological site. There are no pyramids (not even small mudbrick ones), no temples and no large structures. You could easily drive past it without noticing, but you will certainly have seen its products in museums and on television programmes. Gebel el-Asr is the only quarry in Egypt that produced three varieties of metamorphic gneiss, prized by the Egyptians from the Predynastic to the Middle Kingdom for the manufacture of stone vessels and statuary. The most recognisable product of the quarry, the gneiss statue of Khafre from his valley temple (shown in the photo below), even has its own Wikipedia page http://en.wikipedia.org/wiki/Khafre_Enthroned. The Gebel el-Asr gneiss was originally described as ‘diorite’ by Egyptologists, but modern analyses of the stone have identified it as a form of gneiss. Geologists have divided the Gebel el-Asr gneiss into three slightly different forms, but as this differentiation is based on the proportions of different minerals within the stone, the material can be difficult to identify without detailed geological knowledge. As a result, there is considerable variability in the labelling of Gebel el-Asr gneiss objects and it is sometimes difficult to know if a specified object is actually made of the stone. Some artefacts are still labelled ‘diorite’ or ‘Chephren diorite’, while others are described as ‘gneiss’ or ‘Chephren gneiss’. Specific labels such as ‘anorthosite gneiss’ or ‘diorite gneiss’ also occur. Gneissic diorite, and gneissic gabbro are the most difficult to differentiate as they appear very similar, both have a banded appearance, are darker in colour and can only be differentiated geologically by the proportion of feldspars within them. They were favoured for the maufacture of statuary, including the famous statue of Khafre, but stone vessels were also produced. The early dynastic stone vessel shown above is UC6186 from the collection of the Petrie Museum (http://petriecat.museums.ucl.ac.uk/). Gneissic anorthosite, the third variety of stone from Gebel el-Asr is easier to differentiate from the others as it has a lighter hue. It was commonly used for stone vessels, although the head of an anorthosite gneiss statue of Khafre is also known and is located in the Roemer-Pelizaeus Museum in Hildesheim (Inv. 2666/1). 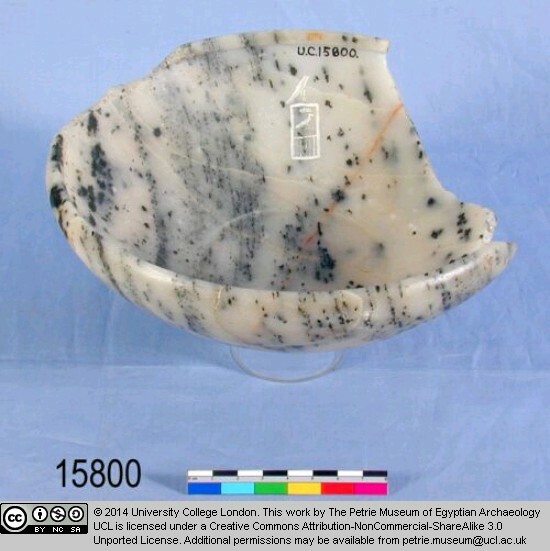 A partly damaged anorthosite gneiss stone vessel from the Petrie Museum with the serekh of King Khaba (UC 15800)is shown below. Weights in several varieties of gneiss are also known. Although the darkness and banding of any given Gebel el-Asr gneiss object may provide an indication of whether it is likely to be anorthosite gneiss or diorite/gabbro gneiss, the issue may become confused where artefacts contain transitions from one type of gneiss to another. Ultimately the only sure method of determining the precise type of stone is examination by a geologist with a hand lens or microscope. Where the precise type is uncertain and in the absence of detailed geological analysis, it is generally best to refer to all products as ‘Gebel el-Asr gneiss’ or ‘Khafre gneiss’, following the suggestion of Rosemarie and Dietrich Klemm in their geological discussion of Egyptian stones and quarries Stones and Quarries of Ancient Egypt. A description of the gneiss, references and further information can be found in Aston, B. G. Harrell, J. and Shaw, I. 2001. “Stone”. In: P. Nicholson and I. Shaw (eds.) Ancient Egyptian Materials and Technologies. Cambridge University Press: Cambridge. 5 – 77. A more detailed geological discussion can be found in the excellent guide to the geology of all Egyptian stones and quarries by Rosemarie and Dietrich Klemm Stones and Quarries of Ancient Egypt published by British Museum Press (2007). An article concerning the geological research done in 1990 is Harrell, J. A. and Brown, V. M. 1994 “Chephren’s Quarry in the Nubian Desert of Egypt” Nubica 3.1: 43 – 57. James Harrell also has details and images of the gneiss on his website http://www.eeescience.utoledo.edu/Faculty/Harrell/Egypt/Quarries/Hardst_Quar.html. For more information about Egyptian stone vessels see Aston, B. G. 1994. Ancient Egyptian Stone Vessels: Materials and Forms. Studien zur Archäologie und Geschichte Altägyptens 5. Heidelberger Oreintverlag: Heidelberg. 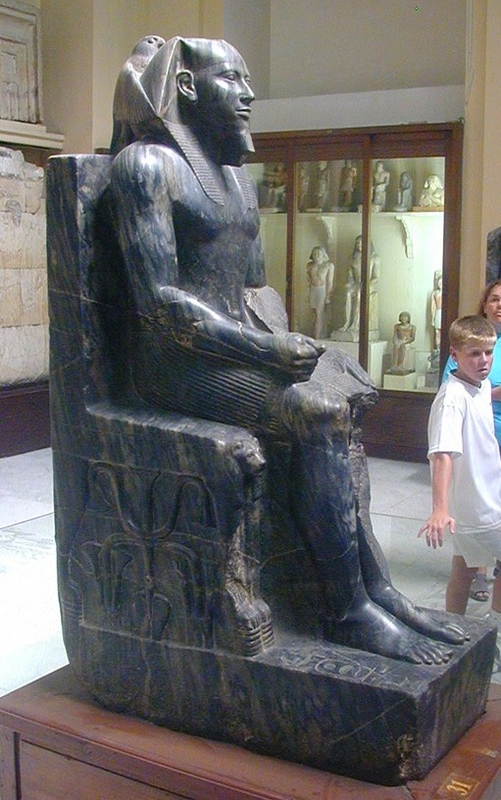 Statue of Khafre from the Cairo Museum, with permission from Richard Sellicks. This entry was posted in Gebel Asr. Bookmark the permalink.